A new mobile phone will be in the pockets of many teenagers as they head back to school in the coming days. The period between Xmas and New Year will have been spent signing up for social media apps where they can chat, share photos and videos with friends, all part of the excitement of owning a new device. But how many of these young people and their parents are aware of the potential pitfalls of spending too much time on social media sites? And what can parents, teachers and young people themselves do to maximize the benefits of life online whilst minimising those pitfalls? It’s a question that Yvonne Kelly, Director of the ESRC International Centre for Life course Studies at UCL and colleagues have been asking as part of a major programme of research on social media use and young people’s wellbeing. Today they publish key new research, which provides much-needed new evidence on the links between heavy social media use and depression in teenagers. The research shines light on the underlying processes that could be at work and that might explain the link between the two. Here, Yvonne explains how their research might help policymakers, educators, parents and young people themselves better understand and prevent the potential pitfalls of living too much of their life on social media platforms. 2018 has seen a growing chorus of voices including those of the former and current Health Secretaries, Jeremy Hunt and Matt Hancock calling for a thorough investigation of the links between social media use and the growing numbers of young people struggling with mental health issues. Indeed Matt Hancock issued “an urgent warning” on the potential dangers of social media on children’s mental health, stating that the threat of social media on mental health is similar to that of sugar on physical health. The Chief Medical Officer, Dame Sally Davies has been tasked by the Government with leading that investigation and with coming up with evidence based recommendations around what constitutes safe social media use and what changes need to be made and by whom to make that a reality. The Royal College of Paediatrics and Child Health (RCPCH) recently issued the first ever guidance on managing children’s screen time, calling for further research particularly into social media. In recent months, we and others have submitted written and oral evidence to two Parliamentary inquiries in this area and had discussions with the Royal Society for Public Health which is campaigning actively to get us all thinking harder about our social media use. We’ve talked about our early research showing that 10 year-old girls who used social media sites for chatting had more social and emotional problems at age 15 than their peers who used them less or not at all. Those problems continued to get worse as they got older. 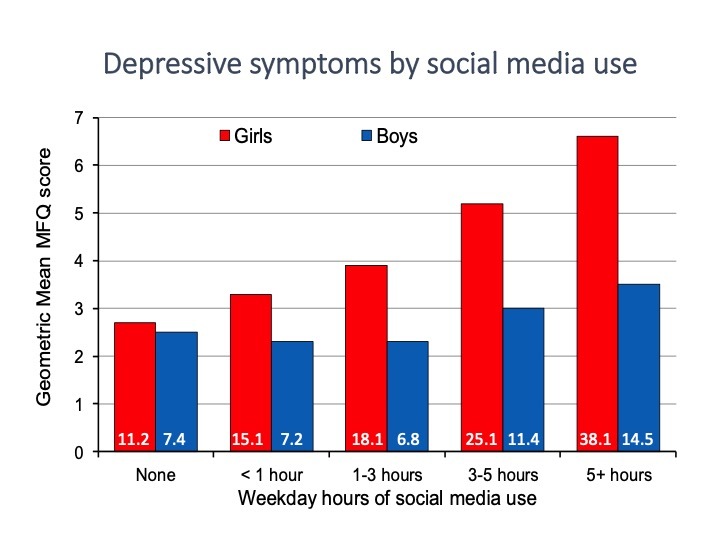 Our new research published in The Lancet’s EClinical Medicine draws stronger links between heavy social media use and depressive symptoms in girls and boys at the age of 14. We look at the possible ways in which social media use might linked to depressive symptoms. We consider 4 potential pathways – through young people’s sleep patterns, their experiences of online harassment, body image and self-esteem. It is the first research to look at all of these potential pathways at the same time. Our data for this research came from the Millennium Cohort Study, which has followed the lives of some 19,000 children born at the turn of the century. This piece of research, looked at the social media use and mental health of nearly 11,000 of the study’s participants. In line with our earlier research, we saw that girls were heavier users of social media than boys with two fifthsof them using it for more than 3 hours per day (compared with one fifthof boys). Girls were a lot less likely NOT to use social media at all (4 per cent girls and 10 per cent boys). Girls, it seems from these findings, are struggling more with these aspects of their lives than boys – in some cases considerably more. When we turned our attention to the signs of depression exhibited by our participants, we could see that here too girls fared worse with scores on average twice as high as those of boys. The link between social media use and depressive symptoms was stronger for girls compared with boys. For girls, greater daily hours of social media use corresponded to a stepwise increase in depressive symptoms and the percent with clinically relevant symptoms. For boys, higher depressive symptom scores were seen among those reporting 3 or more hours of daily social media use. There was a clear link between social media use and all the pathways we investigated – more time spent on social media related to having poorer sleep, more experiences of on-line harassment, unhappiness with the way they look and low self esteem. In turn, these things were directly related to having depressive symptoms. A closer look at the pathways was also revealing. The most important routes from social media use to depressive symptoms were shown to be via poor sleep and online harassment. Social media use linked directly to having poor sleep which in turn was related directly to having more depressive symptoms. 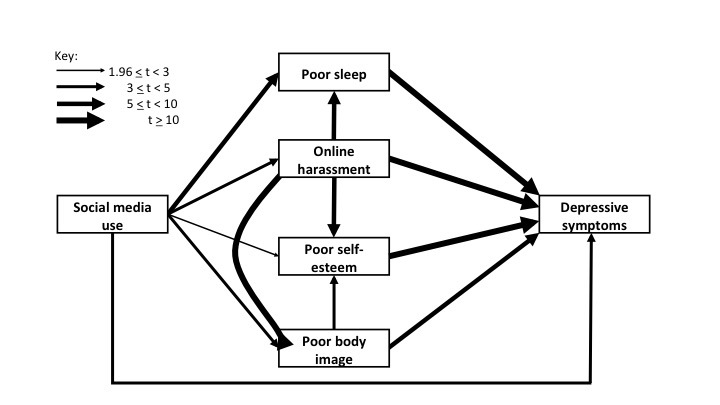 The role of online harassment was more complex, with multiple pathways through poor sleep, self-esteem and body image, all of which linked directly to depressive symptoms. Our findings add weight to the growing evidence base on the potential pitfalls associated with lengthy time spent engaging on social media. In particular they point to poor sleep and online harrassment as being key routes between social media use and depression. These findings are highly relevant to current policy development on guidelines for the safe use of social media and calls on industry to more tightly regulate hours of social media use for young people. They add weight to the Screen Time Guidance issued by the RCPCH today, particularly the suggestion to set and agree child appropriate time limits on screen use. When it comes to social media use specifically, our research indicates that the a similar approach could be useful. Clinical, educational and family settings are all potential points of contact where young people could be encouraged and supported to reflect not only on their social media use, but also other aspects of their lives including on-line experiences and their sleep patterns. At home, families may want to reflect on when and where it’s ok to be on social media and agree limits for time spent online. Curfews for use and the overnight removal of mobile devices from bedrooms might also be something to consider. School seems an obvious setting for children and young people to learn how to navigate online life appropriately and safely and for interventions aimed at promoting self-esteem. Clearly a large proportion of young people experience dissatisfaction with the way they look and how they feel about their bodies and perhaps a broader societal shift away from the perpetuation of what are often highly distorted images of idealised beauty could help shift these types of negative perceptions. As we head into 2019, millions of young people will be getting their first experiences of life online using the devices they got for Xmas. They will rapidly become expert at downloading apps, posting photos and interacting with their peers. With the gift there was no instruction manual to help them understand and navigate some of the pitfalls our research outlines. We hope our work brings, at least, some guidance for all those keen to ensure these children continue to thrive and do well, so that they enjoy the benefits that new digital technology brings whilst staying safe and happy. Social media use and adolescent mental health: Findings from the Millennium Cohort Study is research by Yvonne Kelly, Afshin Zilanawala, Cara Booker and Amanda Sacker and is published in The Lancet’s EClinicalMedicine journal. This entry was posted in Research and tagged Adolescent, Bedtimes, Behaviour, Body image, Children's Health, Cyberbullying, Development, Happiness, Mental health, Millennium Cohort Study, Screen time, SDQ, Self-esteem, Sleep, Social media, Socio-emotional difficulties, Teenager, Young people on January 4, 2019 by Christine Garrington. There have been increasing calls in recent months for more to be done to prepare children for the emotional demands of social media. Just a few weeks ago, the Government’s Science and Technology Committee announced an inquiry into the impact of social media on the health of young people. But do girls and boys use social media as much as each other and is all this time spent Facebooking, Whatsapping and Snapchatting having a detrimental effect on their happiness and well-being? Cara Booker from the University of Essex, in collaboration with collleagues from UCL, has been looking at trends in social media interaction and well-being in nearly 10,000 10-15 year-olds in the UK over a 5 year period. Their findings indicate that girls may be at greater risk and therefore a focus for those looking to intervene to protect and promote children’s happiness. The Government’s inquiry into the impact of social media on the health of young people comes hard on the heels of a report from the Children’s Commissioner for England, which says that children between the ages of 8 and 12 find it hard to manage the impact of online life and become anxious about their identity as they crave ‘likes’ and comments for validation. An explosion in digital and social media platforms has revolutionised the way we all consume media with a recent report showing that young people aged 12-15 spending more time online than they do watching TV. Indeed, it seems a long time ago that parents’ prime concern around media was how much or what kind of TV their child was watching. All these major developments have taken place at a time when we also know that young people are becoming less and less happy. In the most recent United Nations Children’s Fund report, UK adolescents are ranked in the bottom third on overall well-being, below Slovenia, the Czech Republic and Portugal. On the negative side, social media use has been linked with obesity, cyberbullying, low self-esteem and lack of physical activity, all things that can affect the lives of children as they move through school and into adulthood and work. Young people who took part in the Understanding Society survey, were asked if they belonged to a social web-site and then how many hours they spent ‘chatting’ or ‘interacting with friends’ on a normal school day. They could select a range of responses from none to more than 7 hours. At age 10, 50 per cent of girls and 55 per cent of boys said they had no internet access or spent no time on social media. At 15 years, this dropped to 8 and 10 per cent respectively. Ten per cent of ten year old girls reported spending one to three hours a day (compared with 7 per cent of boys) and this increased to 43 per cent of girls at age 15 (and 31 per cent of boys). At age 10 only a very small percent of girls/boys were spending 4 hours plus a day on social media. But by the age of 15, that rose to 16 per cent of girls and 10 percent of boys. Young people who took part in the survey were asked about satisfaction with schoolwork, friends, family, appearance, school and life as a whole and this was used to create an overall happiness score for them. They were also asked about any social and emotional difficulties they might be facing using the well-established Strengths and Difficulties Questionnaire (SDQ) with a higher score indicating more problems. For both boys and girls, levels of happiness decreased between the ages of 10 and 15, however the decrease was greater for girls than for boys. Additionally, whilst SDQ scores increased for girls between the ages of 10 and 15, they decreased for boys. 10 year-old girls who spent an hour or more on a school day chatting online had higher SDQ scores (more social and emotional problems) than girls of the same age who spent less or no time on social media. In addition, the score (number of problems) increased as they got older. So why the gender difference? This is hard to unpick and not something we were able to look at specifically in our research. It may say something about the different ways that girls and boys interact with social media. For example, girls may be more likely than boys to compare their lives with those of friends and peers – whether those are ‘filtered’ selfies or positive posts about friendships, relationships or material possessions – these could lead to feelings of inadequacy, lower levels of satisfaction and poorer wellbeing. The pressures associated with having peers like or ‘approve’ status updates and a perceived fall in or lack of popularity could add further pressure at, what for many teenagers is a tricky time in their lives. Boys are more likely to be gaming than interacting online in the way just described and that wasn’t covered in this research, so it’s possible that changes in well-being may be more related to gaming success or skill. It’s clear that social media is no short-lived phenomenon and our research indicates that girls, possibly because of the way in which they interact online and the amount of time they spend doing so could be at greater risk. In her report, A Life of Likes, the Children’s Commissioner Anne Longfield has called for more to be done to check and stop underage use and to prevent children becoming over dependent on likes and comments and “adapting their offline lives to fit an online image”, something she believes can lead to an anxiety about ‘keeping up appearances ‘ as they get older. Our research really adds weight to recent calls for the technology industry to look at in-built time limits. Young people need access to the internet for homework, for watching TV and to keep in touch with their friends of course, but a body of evidence is emerging to show that substantial amounts of time spent chatting, sharing, liking and comparing on social media on school days is far from beneficial especially for girls. Gender differences in the association between age trends of social media interaction and wellbeing among 10-15 year olds in the UK, is research by Cara Booker (University of Essex), Yvonne Kelly (University College London) and Amanda Sacker (University College London) and is published in BMC Public Health. This entry was posted in Research and tagged Adolescent, Behaviour, Children's Health, Cyberbullying, Development, Evidence, Happiness, Health, Inequality, Internet, Millennium Cohort Study, Online, School, Screen time, SDQ, Social media, Socio-emotional difficulties, Teenager, Television, Well-being, Young people on March 20, 2018 by Christine Garrington. Using longitudinal evidence to support children’s healthy development and give them an equal start in life is the subject of our editor Yvonne Kelly’s keynote address at the Growing up in Ireland Annual Conference in Dublin today. Her talk discusses findings from the most recent of the British ‘birth ‘ cohort studies – the Millennium Cohort Study that have so far informed policy development. They include work by researchers at the ESRC Centre for Lifecourse Studies where Yvonne is based on alcohol consumption during pregnancy, breastfeeding and the introduction of solid foods, the physical punishment of children , childhood obesity, reading to children in the early years, and sleep patterns throughout childhood. She will also share work with the potential to inform future policy challenges such as young people’s drinking, social media use and mental health. This entry was posted in Presentations and tagged Adolescent, Alcohol, Babies, Bedtimes, Behaviour, Binge drinking, Birth, BMI, Booze, Breastfeeding, Children's Health, Development, Diet, Discrimination, Equality, Ethnicity, Evidence, Happiness, Health, Inequality, Infant feeding, Maternal health, Millennium Cohort Study, Nutrition, Obesity, Overweight, Physical Activity, Pregnancy, Reading, Screen time, SDQ, Smoking, Socio-emotional difficulties, Well-being, Young people on November 7, 2017 by Christine Garrington. In 2015 UCL researchers Anja Heilmann, Yvonne Kelly and Richard Watt produced a report, which showed that there was ample evidence that physical punishment can damage children and escalate into physical abuse. Together with the children’s charities that commissioned the report, they called for urgent action to provide children with the same legal protection against violence that British adults enjoy. The report was at the heart of Scottish MSP John Finnie’s proposed Children (Equal Protection from Assault) Bill which the Scottish Government have just announced that they will support in their programme for the coming year. The Bill would make Scotland the first UK country to outlaw all physical punishment by removing the defence of “justifiable assault” of children, and giving them the same protection as adults. Lead researcher, Anja Heilmann, reflects on the news and what she hopes it might mean for the human rights of children in Scotland and elsewhere. On 11 May 2017, John Finnie MSP proposed a Bill to the Scottish Parliament to “give children equal protection from assault by prohibiting the physical punishment of children by parents and others caring for or in charge of children”. After a three month consultation, which received more than 650 responses, the majority positive (75 per cent), that Bill became part of the Scottish Government’s plans for the next year, as Nicola Sturgeon announced she would not oppose it. If passed, the Bill will prohibit the physical punishment of children by ending the existing common-law position that physical punishment by parents can be defended as reasonable chastisement and therefore be lawful. The Bill will not create a new criminal offence, as the common law offence of assault will apply (with a modification removing the reasonable chastisement defence). It’s a far cry from similar efforts made in Scotland in 2002 to prohibit the physical punishment of children under the age of three. Back then, not only did a majority of MSPs reject the idea, but it was branded as “ridiculous” and an unwelcome intrusion into family life by many parents and the media. Those attitudes changed as the result of a clear presentation of the evidence – the hard facts about the damage that those behaviours could cause. We believe that, in this case, our evidence has made it clear for all to see that hitting children can not only damage them, but it carries the risk of escalation into physical abuse. It is a clear violation of international human rights law and children should and must be afforded the same rights as adults in this respect. The evidence for the detrimental effects of physical punishment is vast and consistent. In short, our summary of the available evidence showed that physical punishment was related to increased aggression, delinquency and other anti-social behaviour over time. It also showed the more physical punishment suffered by a child, the worse the subsequent problem behaviour. There was also a clear link between physical punishment and more serious child maltreatment and negative effects continued into adulthood, including problems of drug and alcohol dependency. Half-hearted responses to recent human rights rulings condemning the physical punishment of children need to become wholehearted changes to the law, not tinkering that does just enough to meet the minimum requirements of those judgments rather than properly respect the rights of children. The UN Committee on the Rights of the Child is unequivocal – all forms of corporal punishment of children are unacceptable. Let’s hope the Scottish Parliament can find the courage to make that statement a reality and show the rest of the UK the way. Personally, I am hoping it’s a kind of Scotland and indeed UK, we WILL see in the not too distant future and I appeal to all MSPs to listen to the evidence and support the Bill. Equally Protected? A review of the evidence on the physical punishment of children by Dr Anja Heilmann, Professor Yvonne Kelly and Professor Richard G Watt was commissioned by NSPCC Scotland, CHILDREN 1st, Barnardo’s Scotland and the Children and Young People’s Commissioner Scotland. This entry was posted in Research and tagged Alcohol, Babies, Behaviour, Children, Children's Health, Development, Discrimination, Equality, Evidence, Happiness, Health, Human rights, Inequality, Mental health, Physical punishment, SDQ, Smoking, Socio-emotional difficulties, Well-being on September 12, 2017 by Christine Garrington. A risky problem: what can keep young people away from alcohol and cigarettes? Smoking and drinking among very young people has been declining in recent years, but it’s not all good news. There is still a lot of public health concern around the numbers of older children who are consuming alcohol and cigarettes, as these are the young people most likely to come to harm as a result of drinking too much. Their risky behaviours are also likely to persist and intensify into adulthood. So what factors might prevent a young person from smoking and drinking in the first place? New research published in BMC Public Health shows that levels of happiness among children and awareness of the risks may be key to success. Lead author on the research, Noriko Cable, explains more. According to Public Health England (PHE), alcohol is now the leading risk factor for ill-health, early mortality and disability among those aged 15 to 49 in England. It wants to “prevent and reduce” the harms caused by alcohol. It also has ambitions to create “a tobacco-free generation” by 2025. The most recent figures from the Survey of Smoking, Drinking and Drug Use Among Young People in England show that around 90,000 children aged between 11 and 15 are regular smokers and 240,000 have drunk alcohol in the past week. These figures are the lowest they have been since the survey began in 1982. However, recent research published in BMC Public Health by colleagues at UCL, shows that around one in seven 11 year-olds is drinking alcohol and that having peers who consume alcohol makes them four times more likely to drink that their peers who don’t. We also know that smokers start young, two thirds of them before the age of 18. So we wanted to examine more closely the sorts of things that might drive young people away from cigarettes and alcohol. In this way we hope to arm policy makers, health practitioners and those working directly with or caring for children and young people with information that can help with the development of clear policies and interventions. We focused on three factors thought to play a protective role in preventing young people from starting to smoke and drink. These were: their awareness of the harms, their well-being or happiness and how supportive their networks of friends and family were. Information came from Understanding Society, a large UK survey, which, in addition to collecting a wide range of social and economic information from everyone in the household aged 16 and over, has a special self-completion questionnaire for 10-15 year olds. Our sample contained 1,729 boys and girls. We examined answers at two time points (approximately a year apart) to questions about their smoking and drinking. With these two sets of information, we were able to see whether they had started but then stopped smoking or drinking, whether they were persistent users of cigarettes and alcohol, whether they had started between the first and second surveys (initiation) or whether they had not smoked or drunk alcohol at either point. The children were also asked about how happy they were with different aspects of their lives, including how they were getting on at school, how they felt about their appearance, family and friends and life in general. On a scale of 1-4, the children were asked to rate how risky they thought different levels of smoking and drinking were. They were also asked how many supportive friends they had; friends they could confide in. Nearly 70 per cent of the study participants described themselves as persistent non-users of alcohol and cigarettes, and around 13 per cent categorized themselves as persistent users. Persistent non-users scored highest on harm awareness and happiness tests compared to the other groups. About 8 per cent of the study group labelled themselves as ex-users and about 13 per cent had started using alcohol or cigarettes between the first and second time they completed the survey. Young people aged 10 to 12 were more likely to be in the persistent non-use group, whereas participants aged 13 and above were more likely to be in the persistent user and initiation groups. We were surprised that while, for most young people, knowledge of the potential and actual harms of alcohol and smoking was linked with them never drinking or smoking, for some it seemed to be associated with them starting to drink or smoke. It is possible that positive expectations from drinking alcohol or smoking cigarettes may, in some way, have overridden their awareness of what harm they could do. The happier the young person was, and more aware of the harms of alcohol and cigarettes, the more likely they were never to drink or smoke. Having supportive friends to confide in did not play a role in preventing adolescents from using alcohol or cigarettes. So it seems that promoting young people’s happiness and well-being and making them aware of the harms of smoking and drinking may be key to keeping them away from alcohol and cigarettes. In terms of possible timings for information and interventions, another takeaway from the study might be that working with children between the ages of 10 and 12, before they start trying cigarettes and alcohol, could be important. Because the information used in this study is self-reported, we need to interpret the findings with caution, but they do suggest that making adolescents aware of alcohol and smoking related harm can be helpful in preventing them from engaging in risky health behaviors. Colleagues at the Centre are now getting to grips with the new age 14 data from the Millennium Cohort Study and, in collaboration with Mentor, a charity working on the ground in schools to tackle alcohol and drug abuse, are hoping to develop our growing body of evidence in this area that will help formulate policies and activities to make some of Public Health England’s ambitions around smoking and alcohol a reality. What could keep young people away from alcohol and cigarettes? Findings from the UK Household Longitudinal Study is research by Noriko Cable, Maria Francisca Roman Mella and Yvonne Kelly and is published in BMC Public Health. This entry was posted in Research and tagged Adolescent, Alcohol, Behaviour, Binge drinking, Booze, Children, Children's Health, Drinking, Family, Friends, Happiness, Health, Mental health, School, Smoking, Teenager, UKHLS, Well-being, Young people on May 25, 2017 by Christine Garrington. 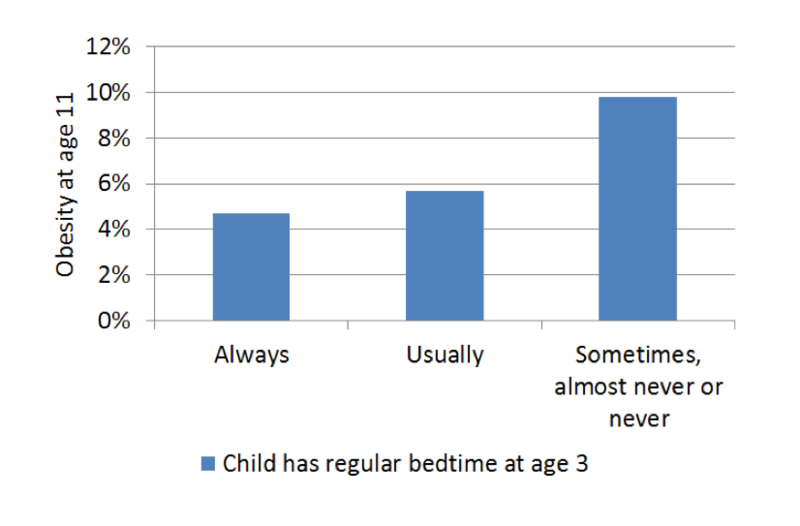 Tackling the childhood obesity epidemic: Can regular bedtimes help? Nearly one in five 10 and 11-year-olds in England is obese, according to NHS figures. With childhood obesity posing not just a nationwide, but a worldwide health threat, public health researchers around the globe are striving to establish which aspects of a young child’s life might set them on a path to being obese later on. Associate Professor Sarah Anderson from The Ohio State University College of Public Health and colleagues from University College London outline the first research to try to disentangle the role of children’s routines and behaviour at age 3 on obesity at age 11 and show that bedtime routines and learning to manage emotions really do matter. The UK’s Chief Medical Officer Professor Dame Sally Davies has warned that the health of millions of children is in jeopardy and is concerned that being overweight is becoming the norm. She fears half the population could be obese by 2050 at a cost of billions of pounds to the health service and wider economy. The latest statistics highlight a stark contrast between the wealthiest and poorest families, with childhood obesity rates in the most deprived areas more than double those in the most affluent areas. Despite the publication in August 2016 of the Government’s long-awaited childhood obesity strategy, charities and health organisations remain highly critical, describing it as a watered-down effort that puts business interests ahead of those of public health. Even the recent introduction of the so-called ‘sugar-tax’ on soft drinks has been met with scepticism in some quarters. To help inform public health strategies going forward, our researchers looked at the bedtime, mealtime and tv/video routines of very young children and their emotional and behavioural development to see if, at this early stage, it is possible to identify those most at risk of becoming obese. The study includes information on nearly 11,000 children collected through the UK Millennium Cohort Study (MCS). When the children were three, their parents reported whether children always, usually, sometimes, or never or almost never had a regular bedtime and mealtime, and the amount of television and video they watched each day. They were also asked a series of questions about the child’s behaviour during the previous six months. Questions were about how children cope with emotions and their persistence and independence in play, including how easily the child became frustrated and whether they sought help from adults when faced with a difficult task. This was to get an idea of how well the child was able to ‘self-regulate’ their behaviour in these areas. Children with regular bed and mealtimes and who watched less television were better able to control their emotions than their peers with less regular and consistent routines. At 11-years-old, 6.2 per cent (682) of the children in the MCS were obese, with obesity more common in lower income and less educated families. Of the routines we studied, inconsistent bedtime was most strongly associated with the risk of obesity, supporting recent findings by our UCL colleagues which showed that young children who skipped breakfast and went to bed at irregular times were more likely to be obese at age 11, stressing the importance of adequate sleep for preventing childhood obesity. Even children who ‘usually’ had a regular bedtime were 20 per cent more likely to be obese than those who ‘always’ went to bed at around the same time. Surprisingly, toddlers with irregular meal times had a lower risk of obesity at age 11. Once other routines were factored in, television viewing was not related to obesity, although it is important to note that computer use was not taken into account, and the media environment for young children today is different than it was when children in MCS were young. There was also a clear link between lower levels of emotional self-control in early childhood and obesity later on. Children with poor emotion regulation at age 3 were over 50 per cent more likely to be obese when studied at age 11. Children’s level of persistence and independence was not linked to later obesity, however, and it is possible that this could be explained by the relative immaturity of the parts of the brain responsible for a child’s cognitive compared with their emotional development at this young age. Our study is the first to look at the relationship between a child’s routines, their ability to regulate their emotions and behaviour and how these factors work together to predict obesity. The two strongest risk factors for obesity were irregular bedtime and a poor ability to control emotions and these were completely independent of each other. In other words, the link between bedtimes and obesity could not be explained away by a child’s inability to regulate their emotions. There is a need to look more closely at the timing and regularity of children’s mealtimes and how they impact obesity later on, as we think there may be a lot more factors at play than we have considered here. We also need to better understand how the development of emotional and cognitive self-regulation interacts with metabolic, behavioural and social pathways to obesity. However, our study supports previous research showing that children’s emotional regulation develops within a family context which includes routines. One message from our study is crystal clear. To be effective, obesity strategies must target early childhood, and must find a way to support parents, especially those from the most deprived areas, to introduce and maintain consistent bedtimes and other home routines, as well as help children regulate emotions and respond to stress. Another key message is that one size does not fit all. There is a lot going on in children’s lives that is important for their health and development. Saying that, it would seem that getting our children to bed at the same time every night could be a simple, cost-effective tool in the tool-kit to get them off to a good start and maybe in the larger battle against obesity. Self-regulation and household routines at age three and obesity at age 11: Longitudinal analysis of the Millennium Cohort Study is research by Sarah Anderson from The Ohio State University College of Public Health; Amanda Sacker and Yvonne Kelly from University College London and Robert Whitaker of Temple University, Philadelphia. This entry was posted in Research and tagged Babies, Bedtimes, Behaviour, Children, Children's Health, Development, Diet, Equality, Evidence, Health, Inequality, Millennium Cohort Study, Nutrition, Obesity, Overweight, Screen time, SDQ, Television on April 25, 2017 by Christine Garrington. Child of our Time editor Yvonne Kelly has shared her latest research findings on very young drinkers with policy makers, senior health professionals and third sector groups. Yvonne was part of a high profile panel presenting research and taking questions from MPs and others with an interest in the creation of a strategy to reduce harm from alcohol consumption. The event, organised by The All-Party Parliamentary Health Group and CLOSER (the UK Longitudinal Studies Consortium), comes as a recent report from Public Health England stated that among those aged 15 to 49 in England, alcohol is now the leading risk factor for ill-health, early mortality and disability and the fifth leading risk factor for ill health across all age groups. It has also been acknowledged that the harmful effects of heavy alcohol consumption go well beyond the implications for public health, presenting both serious economic and social challenges: current estimates of the annual cost to society of alcohol consumption range from 1.3% to 2.7% of annual GDP. In addition, around half of all violent incidents involving adults are alcohol-related. You can find more articles about Yvonne’s research on young people and alcohol by typing ‘alcohol’ into our blog Search bar. This entry was posted in Presentations and tagged Adolescent, Alcohol, Behaviour, Binge drinking, Booze, Children's Health, Development, Millennium Cohort Study, Young people on January 31, 2017 by Christine Garrington. For all the wonderful opportunities and connectivity that the internet has brought in recent decades, it seems likely that 2016 will be the year that the internet is mostly remembered for trolling and cyberbullying. It’s a growing phenomenon, not least among school-aged children. In 2015/16 the children’s charity Childline reported a 2 year increase of 88 per cent in calls from children about cyberbullying and the Government recently funded an app aimed at helping pupils report incidents. Meanwhile, a team of researchers at Queen Mary University of London has been looking for the first time at how cyberbullying affects the mental health of young people later on in their lives. Dr Amanda Fahy explains more. There are three Ps which distinguish cyberbullying from what we might think of as more ‘traditional’ face-to-face forms of bullying: permanence, publicity and permeability. The thinking behind our study was that all these factors may well mean that the mental wounds and scars inflicted on young people who experience this type of bullying, run even deeper. Certainly it has been identified in numerous quarters as a matter of serious public health concern. Whilst one or two international studies have demonstrated a link between being a cybervictim and signs of depression, there is little evidence in the UK to show who is affected and how over time. Our research looks at young people who are bullied, those doing the bullying and those who are both bullying and being bullied and goes onto examine their mental health one year down the line. The research made use of information collected initially from more than 3,000 Year 7 (aged 11-12) students who participated in the Olympic Regeneration in East London (ORiEL) study which was designed to evaluate the impact of the urban regeneration associated with the London 2012 Olympic Games. When the students in the study moved into Year 8 (Aged 12-13) they were asked some questions about their experiences of cyberbullying in the preceding 12 months. These included how often they had received rude or nasty comments from someone, become the target of rumours spread online or received threatening or aggressive comments. The same students were asked if and how often they had been a perpetrator of cyberbullying. Had they sent rude or nasty comments to anyone, spread rumours or sent aggressive or threatening messages online? A year later when the students had entered Year 9 (aged 13-14) students were asked a range of questions about their experiences and feelings from the previous two weeks and this information was used to create scores for signs of depression, social anxiety and poor mental well-being. More than 40% of the students reported involvement in cyberbullying in the previous 12 months – 13.6% as cybervictims, 8.2% as cyberbullies and 20.4% as cyberbully-victims. Girls were a lot less likely than boys to fall into the latter category. Around a quarter of all the young people interviewed showed signs of depression and/or social anxiety and here, with girls more likely than boys to report these symptoms and have lower levels of well-being. Victims of cyberbullying were almost twice as likely as the completely uninvolved youngsters to show signs of depression even after taking a range of background factors into account. The effect stayed strong even after we accounted for them having poor mental health when they joined the study age 11-12. Those who reported both being bullied and doing the bullying were more than twice as likely as those who were completely uninvolved to be depressed, whilst those who said they had only been involved in bullying were no more or less depressed than their uninvolved peers. The findings for social anxiety and lower levels of well-being were similar to the findings for depression, providing us with a clear picture of the damaging psychological impacts of cyberbullying for victims and for those who were both bullied and perpetrators themselves of cyber bullying. With 4 out of ten children of this age involved in some way with cyberbullying and given that our results showed that even low level experiences of cyberbullying can have harmful effects over time, it is key that all those involved in the care, education and well-being young adolescents have a grasp of the issues involved and the tools to reduce and prevent its occurrence where possible. Our research indicates that boys and young people who are both victims and bullies are important groups to target. Longitudinal Associations Between Cyberbullying Involvement and Adolescent Mental Health is research by Amanda Fahy, Stephen Stannsfeld, Melanie Smuk, Neil Smith, Steven Cummins and Charlotte Clark. It is published in the Journal of Adolescent Health. This entry was posted in Research and tagged Adolescent, Behaviour, Bullying, Children's Health, Cyberbullying, Development, Discrimination, Internet, Mental health, Olympic Regeneration in London, Social media, Socio-emotional difficulties, Troll, Well-being, Young people on December 12, 2016 by Christine Garrington. Giving children the best possible start – what matters most? Child of our Time Editor Yvonne Kelly spoke to a 500-strong audience of politicians and professionals in Gothenburg recently on what matters when it comes to giving children the best possible start in life. Yvonne was the keynote speaker at the conference hoping to identify the best strategies for making Gothenburg a more equal and socially sustainable city. Yvonne, Professor of Lifecourse Epidemiology at the ESRC International Centre for Lifecourse Studies at UCL explained which factors are most closely linked with a child’s health and well-being and presented her research findings on children’s verbal skills, behaviour, bedtimes, reading and obesity. This entry was posted in Presentations and tagged Babies, Bedtimes, Behaviour, Birth, Breastfeeding, Cancer, Children, Children's Health, Development, Diet, Discrimination, Equality, Evidence, Happiness, Health, Heart disease, Inequality, Infant feeding, Mental health, Millennium Cohort Study, Obesity, Overweight, Pregnancy, Racism, Reading, Smoking, Socio-emotional difficulties, Well-being on December 5, 2016 by Christine Garrington. Giving children the best possible start in life is the topic of a keynote talk today by our editor Yvonne Kelly. Yvonne will be presenting a range of new evidence from the ESRC International Centre for Lifecourse Studies to politicians, business leaders, and other professionals and key decision makers at an event discussing how Gothenburg can be made an equal and socially sustainable city. Yvonne will talk about the factors which are most closely linked with a child’s health and well-being and present findings on children’s verbal skills, behaviour, bedtimes, reading and obesity. She will make the case that signs of social inequalities are evident early in a child’s life and that it is important to intervene early to tackle those inequalities. This entry was posted in Activities and events, Presentations and tagged Babies, Bedtimes, Behaviour, Birth, Children, Development, Diversity, Equality, Ethnicity, Evidence, Happiness, Health, Inequality, Millennium Cohort Study, Nutrition, Obesity, Overweight, Racism, Reading, SDQ, Socio-emotional difficulties, Well-being on November 15, 2016 by Christine Garrington. Adolescent mental health and risky behaviour – how have things changed for millennials? Do children feel better outdoors?